Should a citizen who can afford to buy a second or third property through the Total Debt Servicing Ratio (TDSR) regime also be required to pay the Additional Buyer’s Stamp Duty (ABSD)? This was a question posed by Mr Christopher De Souza in Parliament on Monday, reported Channel NewsAsia. He urged the government to remove the ABSD for Singaporeans while retaining the ABSD for foreigners and TDSR for Singaporeans. “By retaining the TDSR, the Singaporean is only going to be allowed a credit line that is within his means. By retaining the ABSD for foreigners, we help ensure that the foreigners will not enter the Singaporean market in an overly speculative way,” said the MP for Holland-Bukit Timah GRC. First introduced in December 2011, the ABSD was revised upwards in January 2013 to rein in Singapore’s escalating residential property prices. Singaporeans are required to pay an ABSD of seven percent for a second property, and 10 percent for a third and subsequent property. However, foreigners are required to pay an ABSD of 15 percent for their first and subsequent property purchases. Meanwhile, the TDSR framework limits the amount borrowers can spend on debt repayments to 60 percent of their gross monthly income. Homeowners in Singapore will benefit from paying lower property taxes in 2016 compared to this year, revealed the Inland Revenue Authority of Singapore (IRAS). This is due to the reduced Annual Values (AVs) of HDB and private homes in line with market rentals. In a statement, IRAS said the tax savings for HDB flats will range from nine to 24 percent, while over 80 percent of private homeowners will enjoy tax savings of between three and 20 percent. 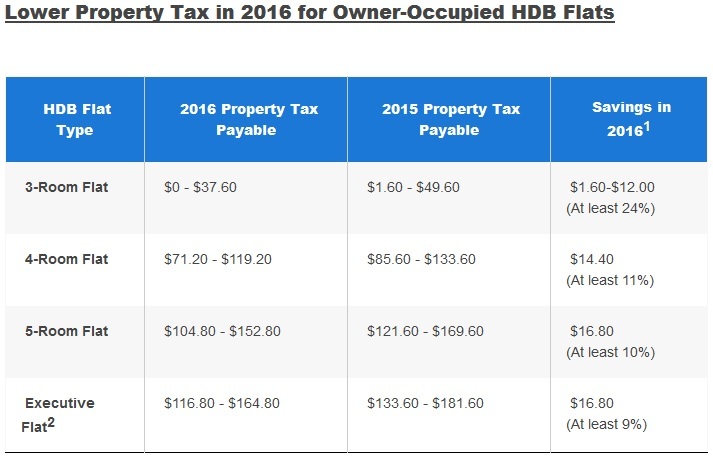 In particular, all 1- and 2-room HDB flat dwellers and 28,200 3-room HDB flat owners will not have to pay any property taxes. IRAS reviews the AVs of properties annually to ensure that they reflect prevailing market rentals. Property tax is a tax on property ownership and it is payable on all properties regardless whether the property is rented out, owner-occupied, or left vacant. According to IRAS, property tax has to be paid by 31 January 2016. A five percent penalty will be imposed on those who fail to pay their tax by that date.